KUALA LUMPUR, 21 September 2018 – Following a highly successful futsal tournament and award-winning documentary screening on the world of sports doping, the AIAC is set to host its third event in relation to its September sports month initiative. The September sports month is part of a broader initiative by the AIAC to bring greater attention to international sports law in general and its application to the Asian sports industry. 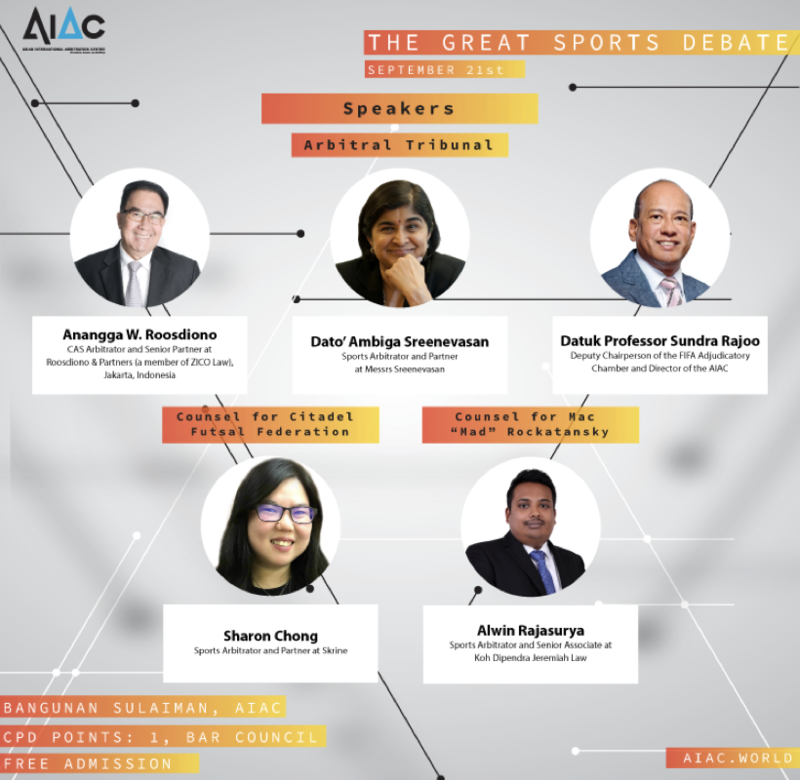 As a highly niche area of law, the AIAC recognizes the infancy of sports law in Asia and is currently spearheading a series of initiatives aimed at raising awareness and promoting knowledge transfer, with the eventual hope for the creation of a dedicated Asian Sports Tribunal here in Malaysia. With strong economic growth, a relatively young population, and growing purchasing power among its middle class, the sports industry in Asia is characterized by a number of lucrative opportunities and potential. In addition to Asia playing host to major world sporting events such as the Olympics and a great many others, the AIAC foresees a rising number of sports-related disputes. This prediction is well in line with recent global trends, with the Court of Arbitration for Sport (CAS), as the world’s preeminent sporting dispute body, administering a record number 600 cases in 2016. Thus, with the goal of promoting knowledge of sports law in Asia, today’s debate is an educational initiative centred on one of the most publicised aspects of sport law, namely that of illegal doping in international and national sports. In what will undoubtedly be an enlightening and thoroughly entertaining debate, the AIAC is proud to present the fictional "3 Arbitrators, An Athlete, A National Futsal Federation & A Doping Violation". The moot will emulate arbitration as a dispute resolution mechanism, adopted amongst others by the CAS for the resolution of sporting disputes. The moot problem is premised upon a doping violation upon which an infringement notice has been issued by a sports federation to a futsal athlete. Appearing as Counsel for the fictional sporting federation is Ms Sharon Chong, Partner at Messrs Skrine and appearing against her as Counsel for the fictional athlete is Mr Alwin Rajasurya, Senior Associate at Koh Dipendra Jeremiah Law. And last but certainly not least, the AIAC is honoured to host a particularly distinguished panel of arbitrators, namely, Mr Anangga Roosdiono, Senior Partner of Roosdiono & Partners (a member of ZICO Law) in Jakarta, Indonesia, Dato’ Ambiga Sreenevasan, Sports Arbitrator and Partner at Messrs Sreeenevasan and Datuk Professor Sundra Rajoo, Director of the Asian International Arbitration Centre and Deputy Chairperson of the FIFA Adjudicatory Chamber. Following this debate, the AIAC is proud to continue its September Sports Month with an upcoming annual Sports Arbitration Certificate course in the following week, along with its annual International Sports Law Conference on the 28th of September. Both the certificate course and sports conference are still available for public registration; however spaces are limited.